Modular Guard Systems Can Be Configured To Fit Almost Any Application. Railing sections are installed and secured to each post using a single bolt. 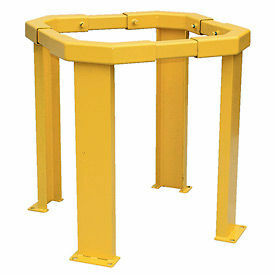 These railing systems are made of heavy duty 3 square tubular steel with safety yellow powder coat finish. Wall Mount Kits secure guard assembly to a wall. Quick and easy assembly.